Everyone has the meals that they remember having a lot when they grew up. Maybe it’s pancakes for breakfast every Saturday morning. For me, it was Sloppy Joe’s. They were a regular staple in our house. It was easy and relatively inexpensive, so we had them a LOT. I sometimes still make them for my kids, and they love them too. And I still enjoy one every now and then. However, I recently decided to try out a new idea I’ve seen a few times. You combine a Philly Cheesesteak and a Sloppy Joe. It’s an amazing idea and I’m totally surprised it’s not a huge trend yet. Believe me, it should be. The result was delicious and a widely successful new recipe in our house. The idea is that you combine the traditional Philly Cheesesteak flavors and put them into the form of a Sloppy Joe. It’s super easy to assemble, because everything is made in one pot (which also means less clean up). Then, your cheese just melts right into your beef and is oh-so-sloppily amazing. 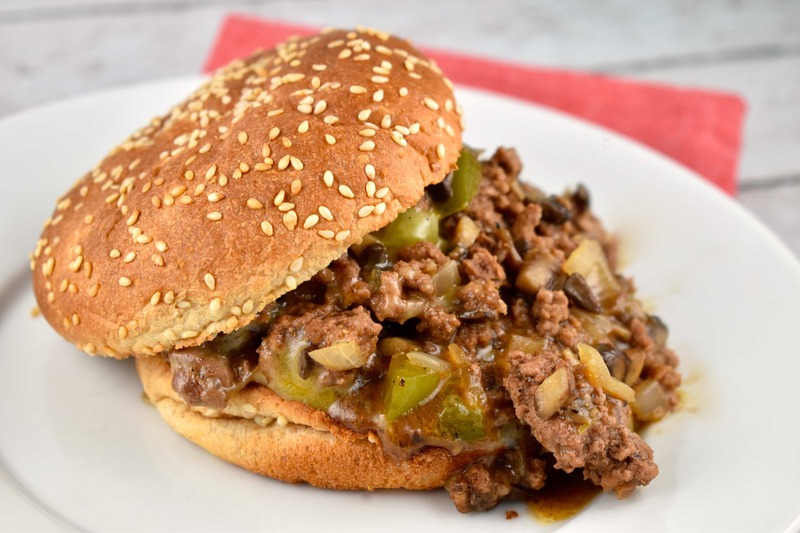 Sloppy Joe’s are a type of loose meat sandwich made with ground beef or pork, and seasoned with onions, peppers, ketchup, Worcestershire sauce and a variety of other seasonings. They seem to have been inspired by a loose meat sandwich from Iowa that was made by a cook named Joe. They gained popularity during the early 20th century and remains a popular dish today. The Philly Cheesesteak was created by a couple in the early 1930s in Philadelphia, Pennsylvania. It consists of thinly sliced meat, grilled onions and peppers and melted cheese served on a hoagie roll. The original sandwich didn’t have the cheese, but it was suggested later and became a huge hit. Numerous variations are available today all over the US. Typically, the Cheesesteak meat is thinly sliced rib-eye or top round that is browned on a hot griddle in oil. With this make over Cheesesteak, you use ground beef that you brown in a skillet. You then sauté your favorite veggies (onions, peppers and mushrooms) and mix everything together with the sauce. Stirring in the cheese and allowing it to melt a little in the pan before serving is essential to help the meat stick together and not just fall off the bun. I seasoned mine with just a little Worcestershire sauce, but added some beef broth and cornstarch. I liked having a little extra sauce to really make this into more of a Sloppy Joe. I also recommend a light provolone, which is one of the classic cheeses used in the Cheesesteak. However, kids might enjoy some American cheese slices melted onto their meat instead. The recipe calls for toasted sandwich thins to help cut down on the carbs and calories in the recipe. However, you can use regular buns or even the classic Cheesesteak hoagie rolls if you prefer. And keep in mind, when I took pictures for this, I just used the buns I had on hand, which weren’t sandwich thins. However, you can get the idea. LIKE THIS RECIPE? TRY THESE! A popular American sandwich takes the form of a favorite childhood dish in this tasty and easy recipe. It will have you falling in love with the Sloppy Joe concept all over again! Set a large skillet over medium high heat. When pan is hot, add in ground beef, and cook until beef is well browned. Remove beef and set aside. Add the butter, onions, peppers, and mushrooms to the pan. Sauce for about 4- 5 minutes. Return beef to the pan, and mix well with the vegetables. Mix the beef broth and cornstarch together in a small bowl, then stir it into the pan. Then stir in the Worcestershire sauce, and salt & pepper. Cook until almost all of the liquid is gone. Remove pan from heat, and add in the provolone cheese. Scoop out onto toasted buns, and serve. I would use less Worcestershire. It made it way too sweet for me. I’l try again but make a few modifications. I also used ground turkey…I think that messed it up. Delicious! My entire family enjoyed this recipe. I hope you’ll consider adding a print button to your recipes at some point. Your recipes never print properly for me & I always have to write them down. I appreciate the nutritional values so I can quickly calculate WW points since I’m using an older program. Do you know the sodium count for this recipe? I’m always wishing you had a print button for your recipes…or am I just missing it? I am able to get them printed, but it’s awkward to do. I’ve looked and looked, but if there is one, I just can’t find it. Love your recipes though! How do you remove the ads that pop up in the middle of the recipe? This is very annoying – especially when these stores are no where around where I live.